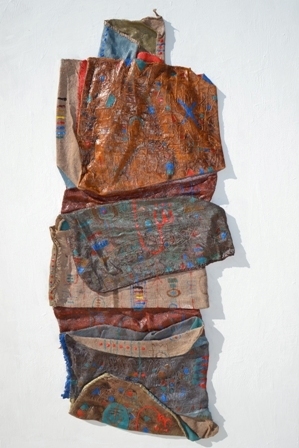 Moosa Omar is a mixed media artist whose works reflect elements and stories from daily life and mirror his traditional Omani roots. He uses symbols and motifs, colours and textures to produce his own distinct narrative. He has held over 11 solo exhibitions In Oman, Bahrain and Egypt and Kwuait and Qater and Abu Dhabi and Germeny , He has traveled and exhibited widely across the globe; participating in shows in several European countries, the USA and Mexico, Turkey, Iraq, Pakistan, India, Algeria, Morocco, Taiwan, Lebanon, Australia, South Korea, Egypt, Japan, Jordan, Syria, Bangladesh, China, and the Arabian Gulf. Notable exhibitions include shows at The White House – USA, The Indira Ghandi National Centre for Arts – India, National Art Gallery Shilpakala Academy Dhaka and Bangladesh National Museum – Bangladesh, Centre of Fine Art Berlin – Germany, National Centre for Performing Arts – China, O.N.S.C.O Beirut – Lebanon, U.N.E.S.C.O Paris and the Institute du Monde l’Arab, Paris – France, Palace of Culture – Algeria, Palace of Arts El Gezeira and Museum of Modern Egyptian Arts - Egypt, Korea International Library, The Olympic Museum – Switzwerland and the Olympic Museum – Australia, Museum of Modern Bagdad- Iraq, Taipei Fine Art Museum – Taiwan, Bait Al Zubair Museum and Bait Muzna Gallery – Oman – Museum of Art Tunisia .